Arney’s Mount Friends’ Meeting House – Burlington County, NJ ~ The History Girl! It is not often that you come across a location that takes you this far back in history. By luck, travelling the back roads of Burlington County, I found myself at this strange stone building surrounded by a stone wall cemetery. As I got out of the car, I came to discover that it was named Arney’s Mount Friends’ Meeting House and was inscribed with the date of 1775. This unique, vernacular stone building I discovered has a fantastic history and signifies the important stronghold that the Quakers once had in southern New Jersey. Quakers first established a Meeting for Worship in 1743, under the care of the Burlington Monthly Meeting. According to the minutes for October 3, 1743, "sundry Friends belonging to the upper part of Mount Holly Meeting made application in writing to Burlington Monthly Meeting for liberty to hold a meeting for worship on the first day of each week, during the winter season, at the meeting house standing near Caleb Shreve's Mount." Prior to its ownership by Arney Lippincott, it was known as "Shreve's Mount, or merely "Mount." Historians are not sure whether or not the current structure was the first at the site. Conflicting information exists as to whether the earlier structure was erected as a meeting house or was actually a log schoolhouse being used for meetings. There is very little information existing to confirm either stance, or to describe that structure that formerly stood at Arney's Mount. The Burlington Quarterly Meeting records give compelling evidence to support the theory that the log building was constructed as a meeting house. First, in May 1741, they recorded that a meeting house was "about to be built" near Arneytown. Then later, in 1776, when the minutes record the completion of Mount and three other meeting houses in the quarter, it is stated that these meeting houses are "all near the respective places where the former houses stood." Adding to the confusion, however, is the fact that a 1860 diagram of Burlington Quarter indicates the simultaneous existence of both a "Mount" and "Arney town" meeting. Other references to an earlier meeting house include a 1771 notation within the journal of Ephraim Tomlinson in which he mentions attending a marriage at the log meeting house near "Julytown." The name S. Smith etched into the stone. Regardless, the meeting house was built between 1775 and 1776 of local bog iron stone. There is no known architect for Arney's Mount Meeting House. The design most likely was derived from the members themselves, perhaps in consultation with a local builder. According to oral tradition, Samuel Smith was the builder. Inscribed in a stone of the meeting house is "S. Smith." It was not uncommon within mainstream culture for the builder to carve his initials upon the structure. Such practices were generally frowned upon by Quakers. It was viewed as vain, and ran contrary to the communal nature of the design and building process. More common among Friends was the practice of carving initials merely as a form of graffiti on the interior benches, and sometimes on the facades of meeting houses, although rarely are they so prominently placed. Members of the Smith family attended Arney’s Mount meeting and acted as trustees for the meeting, and therefore could have played an important role in the construction of the meeting house. On the opposite side of the meeting house is the name "I. Coate." This suggests that Smith was not solely responsible for the construction of the meeting house. Perhaps one's role was largely financial while the other served as builder. Arney’s Mount suffered two fires in the early 1800s. The first was 1800 and the second was 1809. The second fire nearly destroyed the building except for its stone walls. 1775 etched into the stone. Due to declining membership the final meeting was held in 1871, and its remaining members attached to the Mt. Holly Meeting. After this time, the meeting house was used occasionally for worship until finally discontinued in 1898, although occasional meetings were held. With renewed interest, the meeting was revived in June of 1941, under the care of Mount Holly Meeting. In March of 1942, with thirteen members in attendance, it was proposed that Arney's Mount become a "regularly established meeting.” Among the members of the newly-revived meetings was Elizabeth White, eminent botanist and proprietor of Whitesbog, the cranberry bog owned by her family since the mid-nineteenth century. In more recent years, young families have joined the meeting, and Arney's Mount is enjoying continued rejuvenation. What really makes this site unique is its near pristine interior. Although dating to the reconstruction that followed the second fire, the facing benches, gallery, and other wood elements and finishes are intact, dating to approximately 1811. The building is still without electricity or plumbing, and a wood stove serves as the only heat source. 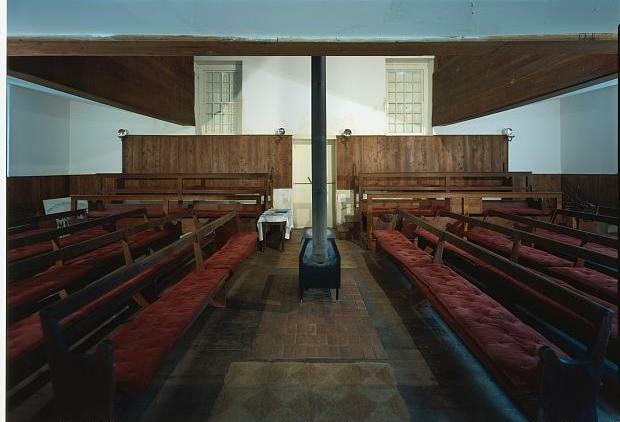 Interior of Arney's Mount Friends' Meeting House, provided by HABS. Coupled with the still rural nature of the surrounding landscape, the Arney's Mount Meeting House of today is almost indistinguishable from that portrayed in historic photographs. Since the building is usually shuttered, the Historical American Building Survey (HABS), provides a wonderful view inside of this building. In 1999, HABS performed a detailed analysis of the history and architecture of the site. The most fascinating aspect of the entire site is that it survives without electricity or running water! The 1930s era privy in the burial yard is a treat to visit if you have never see a true outhouse. After leaving the meeting house, about a mile from the property on Birmingham-Arneys Mount Road, another bog iron stone structure appeared, with a timber second floor. Its footprint was very small and it appeared there was once a small addition on the right side and possibly a lean-to in the rear. A stone showed the date of 1823 and the initials AL – could that be Arney Lippincott, the owner of the meeting house property? I could not find any reference to this building or its history in my research. The initials A L and the date 1823. Could this be Arney Lippincott? Whose home is this? Arney Lippincott? If you know anything about it, please let me know! I enjoyed the report of your visit. One line of my ancestors, the Gauntts, were Quakers in Burlington County. I'm becoming more & more interested in them. I used to work with Bert Gauntt at Okidata. Might she have been related to you? Thank you for this research, information and photos. This appears to be the same Samuel Smith as is my 6th great grandfather!